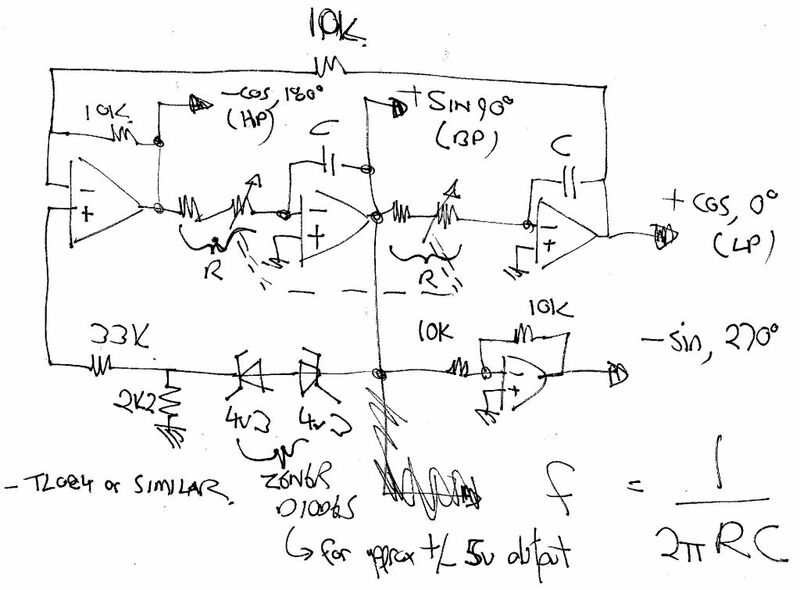 I found some schematics for a sine+cos LFO using 2 op-amps - is it possible to control the frequency with a single potentiometer without adding more op-amps or transistors and keep the same output amplitude? Only if it's a dual-gang pot with good tracking between the two gangs. thanks, could you please point me to a schematic (if it exists)? I'm not absolutely sure this will work (because when I wrote that I hadn't noticed that this is actually a three-pole circuit), but it would make sense to have R1 and R3 be the variable resistances in the schematic you posted. I'd suggest trying that first. I have this (see PDF attached, disregard VCA's as they do not work properly! ), but it is meant for only a single phase output. You could use the remaining unused opamp for the cosine output, but you'd still end up with a quad and not a dual opamp. 2 OTAs figure 35, put a pot divider on Vc. If you're willing to use OTAs instead of op amps as such, that's probably the best thing to do. The circuit is basically a VCF circuit driven into oscillation permanently. As an added bonus, it's easy to add a control voltage input, because the pot is basically just being used to generate a control voltage anyway. In other simple circuits where it'd be functioning as a variable resistor, voltage control would be harder to add. It's because of this issue that my Fixed Sine Bank module is fixed-frequency. One op amp per output, and I can fit eight of them comfortably in 8HP with through-hole construction. 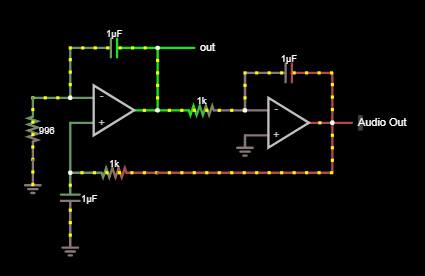 When it comes to analog sine LFOs, just being able to change the frequency makes the circuit a whole lot more complicated. What is the reason to keep it (perhaps too) simple? Do you want to build a massive amount of them, or do you feel that it is hard to do on stripboard? Cost? Trying to do it with a dual opamp package is not going to work if you want a large tuneable range, the twin T will work for less than an octave if only small shifts are needed but larger shifts distort the quadrature wave. how perfect of a sinewave do you need? you could go with a standard relaxtion oscillator, which just needs 1 pot to control frequency, and then do waveshaping afterwards to create the 90degree shift and the sinewaves. What is the reason to keep it (perhaps too) simple? how perfect of a sinewave do you need? Had a simple quadrature LFO many years ago, more or less as diagram below. Very difficult to find anything cuirrenty on these on the web? THis is essentuially a state variable filter that is oscillating. I'm not sure I've got the feedback and stabilisation correct (lower left components). figure 5.1.2 in the document mungo linked is pretty similar, and this state variable filter approach is probably the lowest parts count (although requires a dual gang pot). I guess the max voltage depends on the diodes? And maybe slightly changing the value of some particular resistor might make it rise from 0 to max faster? R6 and R7 determine the rise time and final amplitude. try increasing R7 to 120k and decreasing R6 to 1k. the distortion looks like to goes down, and it rises a bit faster, and the amplitude is much higher. lower values do seem to make it slightly faster, but still too slow, especially at lower frequencies (and I need this to be a slow LFO). And if the value is too low it starts to clip. I think R6 and 7 just increase the amplitude and with higher amplitude it rises faster. Maybe if there was a way to inject some voltage somewhere when it powers up? i was wondering about that. i ran a simulation, and saw the same, long settling time, and it doesnt make a lot of sense to me. there isnt anything in that circuit with such a long time constant. and ive put state variable filters into oscillation before and they didnt take forever to settle either. im wondering what is in their (falstad) model that does this, and how much it reflects reality. so, i dont claim to understand this completely, but here is my take on the settling time: this is basically a filter being held at a damping factor of exactly zero. the lower the damping factor, the longer it takes to settle, so this one essentially never settles. the diodes act as feedback, and change the damping factor with output amplitude, to keep it at a certain amplitude. at low ampitudes, it has a negative damping factor, and the amplitude increases; at high amplitudes the damping factor increases and the amplitude goes down. if the difference between the diodes being active or not is a small amount, directly around zero, you will get a very low distortion output that that takes a long time settle, and may not start oscillating to begin with. imagine if the damping factor was 0.001, how long it would take to settle, and essentially this diode feedback tries to keep it near zero, so it spends a fair bit of time at low values like that. 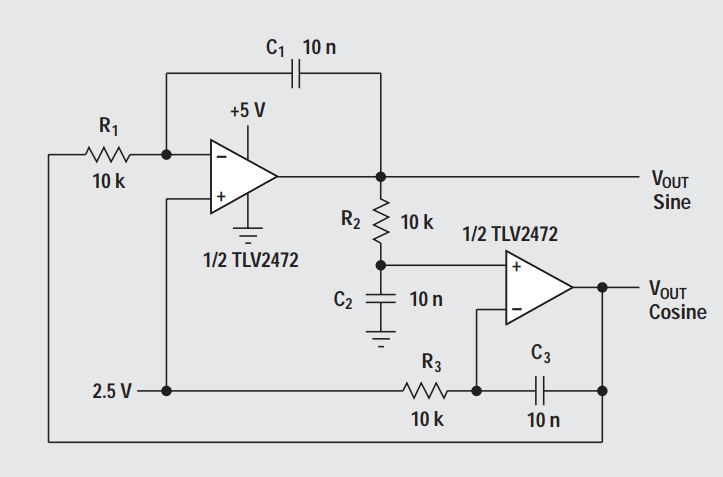 but, if you were to make the difference between the diodes being active and inactive very large, then the area around zero damping would span a much larger range, and the filter would settle much quicker. unfortunately, this would also add a lot of distortion to the signal. so there is a tradeoff, you can get fast settling, but it will be more distorted. also, is there some often used way of charging the capacitors when the circuit powes up that doesn't interfere with the circuit afterwards? so, is the issue that it takes too long to stabilize at startup, or that it takes too long to stabilize when you shift frequency, or both? from my simulations, i think those two times were about the same. but, if its just startup time, then you could do some sort of RC switch with a transistor or something. as for distortion, take a look at the signal across the diodes. the less this looks like a sinewave, the more distortion there will be. the first integrator stage will show more distortion than the second.